Did you know that winter can be a great time to observe orchids? Some species of orchid have evolved a survival strategy where leaves come out in winter, and are referred to as a “winter leaf orchid” or a “hibernal leaf orchid” (hibernal means occurring in winter). Puttyroot (Aplectrum hyemale) and cranefly (Tipularia discolor) orchids are two winter leaf orchids in Pennsylvania. Puttyroot orchid’s leaf is a green oval, covered with white pinstripes running from stem to tip. It has a pleated look to it and sometimes a purplish tinge to the edges. The name comes from a paste made from crushing the roots that may have been used by Cherokees as a baby food. Puttyroot also is called “Adam-and-Eve” because the new year’s root (Eve) forms attached to the previous year’s (Adam). Cranefly orchid’s leaf is bright green, pocked with dark purple spots. The underside of the leaf is a deep, rich purple. The name “cranefly” comes from the appearance of the flowers, which slightly resemble crane-flies. Both plants can be found in deciduous or mixed forests and bottomlands, often in acid soils. You often see these leaves in large groupings, but it is thought that one plant produces only one leaf. When you think about it, a winter leaf makes sense -- plenty of sunlight is available without a leafy overstory shading it out and no competing neighbors. The leaf photosynthesizes all winter long, storing carbohydrates in its root or corm. The plant produces only one leaf, which dies back in summer and is gone by the time the plant flowers during May to August. Orchids can live underground in their root for years, only blooming when the conditions are right. Cranefly orchid flowers are small and greenish-purplish color; and puttyroot orchid flowers are small and drab tan color. The flowering stalks are slender and the plants can be easily overlooked in summer, with lots of other vegetation around. 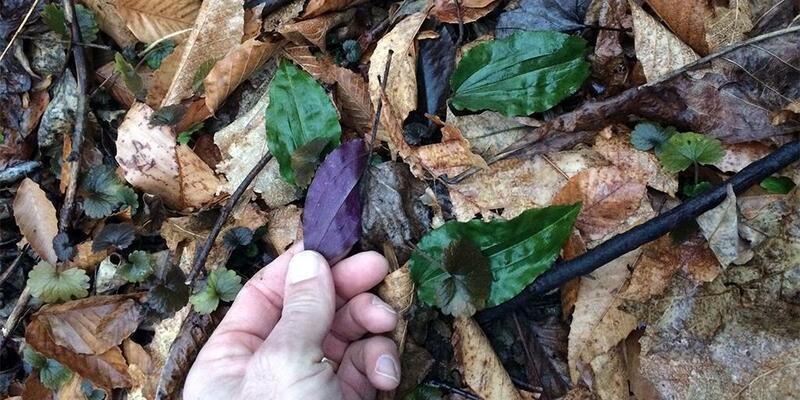 The bright green of the leaves in winter is the best way to identify these plants. Why not visit a state forest or state park near you and see if you can find them?